Eco Friendly Office Spaces – and Why You Can’t Trust Kermit the Frog. Home >> Green Living Tips >> Eco Friendly Office Spaces – and Why You Can’t Trust Kermit the Frog. Posted by Caroline in Green Living Tips, Guest Blogs | Comments Off on Eco Friendly Office Spaces – and Why You Can’t Trust Kermit the Frog. Kermit the Frog lied to us, because it turns out that it’s actually really easy being green. Creating an Eco Friendly or ‘Green’ Office is not as daunting a challenge as you may think, but before we dive into the how and why of going green let’s take a look at the different challenges that most commercial workspaces face and what obstacles stand in the way of a smooth transition to an ecologically friendly work environment. There are 2 main approaches to going green at work and the first one applies when you are creating an entirely new office. In this particular instance there are a lot more positive steps you can take as you can literally ‘go green from the ground up’. Steps in this case include (but are not limited to) installing a green roof*, installing efficient windows and shades**, and of course looking at the utilities being provided and opting for greener energy alternatives as well as putting water and waste recycling systems in place. *Green roofs cover the top of a building with a living layer of plants, grass or other vegetation that acts as an insulator. **Modern windows are more efficient and work to block the heat from entering buildings in the summer, while retaining heat inside the building during winter. The second, and by far the more common situation is when you either wish to make your existing office space more eco friendly or you are moving to a new office space and wish to make this more ecologically friendly before you move in. Obviously in these situations you are limited by what you can do. The green roof and efficient windows are definitely a no go, as are any structural changes or recycling systems you were thinking of implementing. This limits your ability to ‘go green’ but it definitely does not prevent you from making some drastic, environmentally positive changes. 1. Use Energy Saving Computers. Most computer systems these days are already quite energy efficient but only when you take advantage of the software. Use the power management options to set monitors to turn off after a certain period of inactivity, set the computer to ‘hibernate’ at the close of business each day. *The US Environmental Protection Agency (EPA) estimates that smart power management alone can save more than $50 per computer each year. This is not just limited to the technology of automated lighting systems – dimmers, timers, motion sensor activiated lighting etc. Granted these changes will dramatically decrease the amount of energy used each year it is sometimes out of your hands as the building is owned by a third party. Talk to them about the installation of smart lighting as it will save them money in the long run – but failing this, no one said you couldn’t change all the bulbs to fluorescents, which use at least 30% less power than traditional incandescent bulbs. 3. Take Advantage of Natural Lighting. 4. Use Smart Climate Control Systems. This goes beyond the basic premise of turning the air conditioning off when a room is not being used. Smart climate control systems can be configured to do all tis for you, with motion sensors automagically doing everything, but fail to apply common sense and it is all for nought. There is no point trying to be energy efficient with your air conditioning when every window shade in the office is open and allowing sunlight to stream directly in. *Most modern office window shades are designed to allow the light to filter through without the associated heat. It probably seems strange that in a digital world I am suggesting you become even more digital, but in the office environment it’s importance is paramount. An average office worker will go through 100’s of sheets of paper each year, and that is not including what comes out of the printer! Take advantage of instant messaging and file sharing services to pass information and ideas to your co-workers. Provide a carpool-matching services that allows employees to find other workers who live in their area. Encourage biking and walking to work by providing bike racks outside of the office. Provide parking incentives such as closer/shaded parking spots for carpoolers. Allow users to telecommute (work from home) once a week. There are a thousand ways we can help make the office a more eco friendly space, and in most cases it comes down to applying some common sense and taking time to think about something other than your client and your deadline. 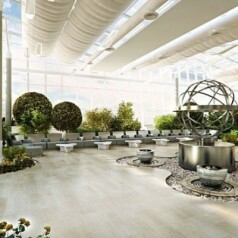 Can you think of or have you tried other methods of helping your office become a ‘greener’ place? I would love to hear your thoughts in the comments. Caroline Webber is head of marketing and strategy for OfficeFitoutSydney.com.au, A Sydney based firm supplying Eco Friendly Office Renovations Fit Outs and Office Refurbishment Services. Whether you need an overhaul of your existing workspace or you’re moving to a new one, Office Fit Out Sydney has the experience, skills and expertise to get the job done on time AND on budget.